I have always loved the outdoors and enjoy sharing my passion for nature study with others. I’ve recently completed my coursework to become a certified Oregon Master Naturalist. To celebrate, I thought it would be fun to create a little quiz to help you get to know Oregon a little better. My vision is to create a new quiz every quarter. What kind of rodent is this? 2. What is this creepy looking black thing? 3. Can you name this flower? 4. Is this cutie a lizard or amphibian? Can you identify the genus? 5. This invertebrate is a common sight along the trails and even in our gardens. What is it? 1. 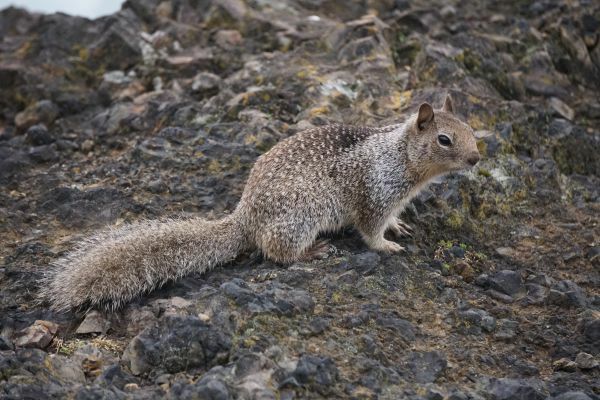 The California ground squirrel (Otospermophilus beeches) is pictured here on the rocky shoreline in Depoe Bay. The squirrel’s upper parts are mottled, the fur containing a mixture of gray, light brown and dusky hairs; the underside is lighter, buff or grayish yellow. The fur around the eyes is whitish, while that around the ears is black. Head and body are about 30 cm long and the tail an additional 15 cm. As is typical for ground squirrels, California ground squirrels live in burrows which they excavate themselves. Some burrows are occupied communally but each individual squirrel has its own entrance. They commonly feed on seeds, such as oats, but also eat insects such as crickets and grasshoppers as well as various fruits. 2. It is rather common in the maritime Pacific Northwest, Frog Pelt Lichen (Peltigera neopolydactyla) can range in color from bluish green to olive brown. It is found growing on both rocks and dead wood, in shady, open forests at varying altitudes. 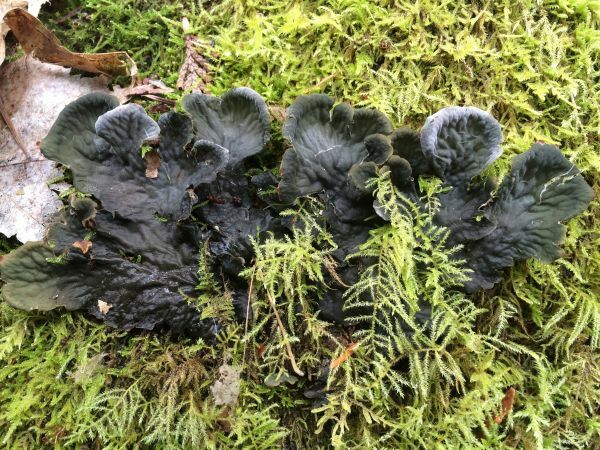 A large, loosely appressed leaf lichen, the lobes are broad, 10-25 mm wide, and the upper surface hairless. Often bearing brownish, tooth-like fruiting bodies on raised lobes along the lobe margins, the lower surface is whitish, cottony, bearing low, broad, brownish or blackish veins and long, slender holdfasts (rhizines). 3. 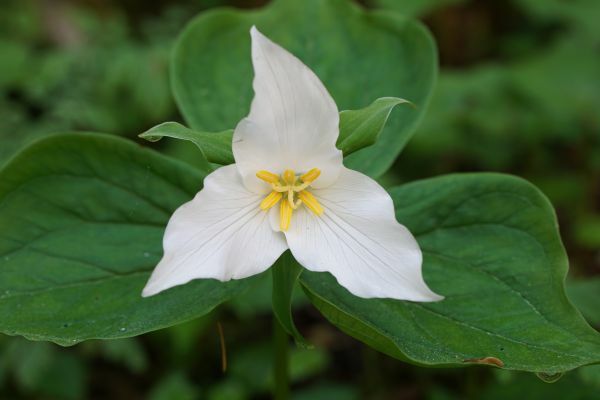 Trillium (sometimes called Wakerobin) is a genus of perennial flowering plants native to temperate regions of North America. Growing from rhizomes, they produce scapes (similar to a stem) which are erect and straight in most species but lack true, above ground leaves. Three large photosynthetic bracts (modified leaves) are arranged in a whorl about the scape. The flower has three green or reddish sepals and usually three petals in shades of red, purple, pink, white, yellow, or green. 4. 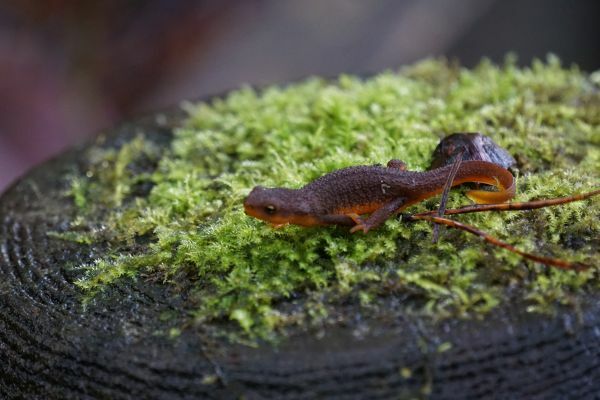 Rough-skinned Newts are amphibious and are often seen moving to breeding sites during the breeding season. Migration to and from breeding sites varies among populations. Some newts spend the dry summer in moist habitats under woody debris, rocks, or animal burrows with adults emerging after the fall rains. In some populations, adults remain in the ponds and lakes throughout the summer and migrate back onto land in the fall when the rain starts. Often they will form large aggregates of thousands of newts in the water. Poisonous skin secretions containing the powerful neurotoxin tetrodotoxin repel most predators. The poison is widespread throughout the skin, muscles, and blood, and can cause death in many animals, including humans, if eaten in sufficient quantity. Populations in Crater Lake have been shown to lack this neurotoxin. In most locations the Common Gartersnake, Thamnophis sirtalis, is the only predator of the newt. 5. The infamous banana slug is the common name for three North American species of terrestrial slug in the genus Ariolimax. 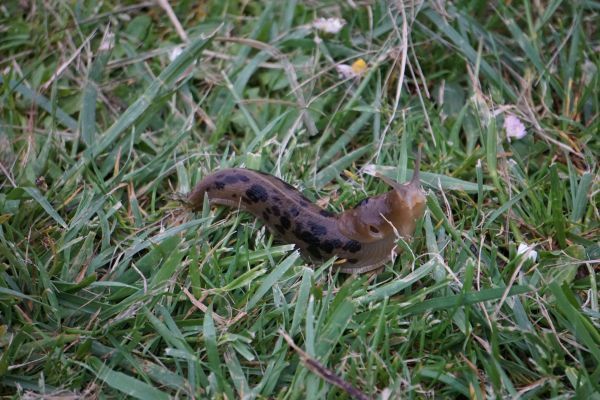 These slugs are often yellow in color and are sometimes spotted with brown, like a ripe banana. These shell-less mollusks are detritivores or decomposers. They process leaves, animal droppings, moss, and dead plant material, and then recycle them into soil humus. 5 points: You must be a nature docent! 4 points: You are at home on the coast. 3 points: You think the coastal forest is beautiful, but would never spend the summer here. 2 points: You guessed randomly, right? 1 or 0 points: You’d really rather stay indoors. I recognized 4/5 pictures posted on your website.